On Wednesday, 29 of January 2014, the «Zurich Chess Challenge 2014» will commence at the Hotel Savoy. With six participants it is the first tournament in the history of chess to reach category 23 with an amazing average rating of 2801! 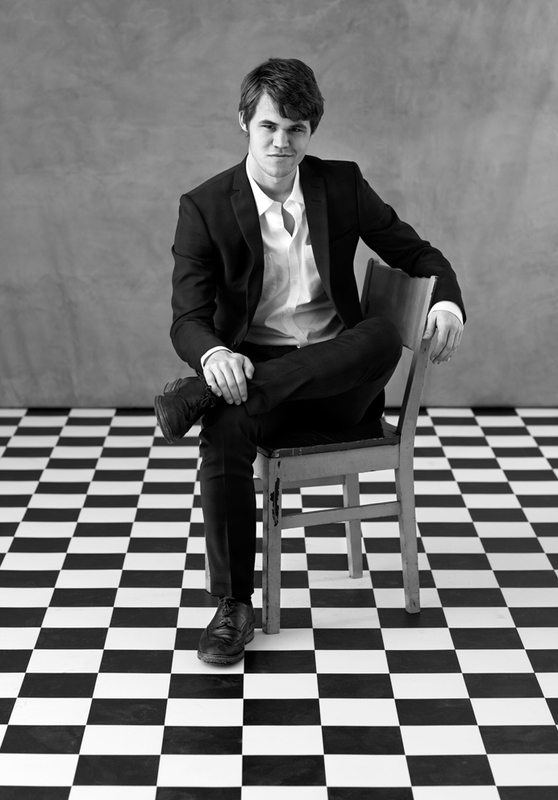 The star of the «Zurich Chess Challenge 2014» will be the newly crowned world-championMagnus Carlsen. During his first tournament appearance since winning the world title last November, the 23-year old Norwegian will compete against his predecessor and former world-champion, Viswanathan Anand of India (number 9 in the world-ranking), the Armenian Levon Aronian (2), the American Hikura Nakamura (3), the US-Italian Fabiano Caruana (6), as well as the Israeli Boris Gelfand (8). This brilliant event, which will take place in the extraordinary familial environment of the ballroom of the Hotel Savoy, has already caught the attention and led to the registration of many journalists and top-players from throughout the world, including Peter Leko,Jan Timman and Gennadi Sosonko. Further, the Chinese women's world-championHou Yifan will attend this unique occasion and will be playing a simultaneous exhibition with clocks against 6 top Swiss juniors on 1 February at 1 p.m. at the Zurich «Zunfthaus zur Saffran». For the «Zurich Chess Challenge 2014», a blitz tournament will determine the color distribution on the first day. Five rounds of classical chess will then be played from Thursday to Monday (30 January to 3 February), followed by a rapid tournament with reversed colors on the last day (4 February). A won game in the classical tournament counts two points, draws one point. Wins in the rapid tournament count one point and draws half a point. All games will be commented live by GM Yannick Pelletier and IM Werner Hug and broadcast world-wide live via Internet on www.zurich-cc.com. Admission to the classical and rapid games of this formidable event is free and no previous registration of spectators is required! The «Zurich Chess Club» was founded in 1809 and is the oldest active chess club of the world. With the «Zurich Chess Challenge 2014» it will continue its long-standing tradition of hosting top-level tournaments, which have included such memorable events as the «Candidate's Tournament 1953», the simul and rapid tournament of all living world-champions at at the Zurich main train station 2009, the «Zurich Chess Challenge 2012» with Levon Aronian and Vladimir Kramnik as well as the «Zurich Chess Challenge 2013» with the four grand masters Vladimir Kramnik, Viswanathan Anand, Fabiano Caruana and Boris Gelfand. The «Zurich Chess Club» is very proud to be the organizer and host of this unique event. Further, it would like to thank the main tournament sponsor and chess-enthusiast Oleg Skvortsov from the «International Gemological Laboratories» of Moscow, Russia, whose generous contribution has allowed for this extraordinary happening! We look forward to welcoming all our friends from throughout the chess world either at the Hotel Savoy or live via the Internet! Daily from 30 January to 4 February 2014. The rounds start at 15.00 local time (CET), except for the last round, which begins at 13.00 CET. Spectators are welcome, entrance free. «IGC International Gemological Laboratories» is a Russian institute providing gemological services, such as diamond grading reports, enhanced diamonds identification, man-made/synthetic diamonds and imitation detection, as well as certification of diamonds, gemstones and jewelry in the Russian Federation. IGC is the Russian branch of «GCI» a group of gemological laboratories located worldwide. 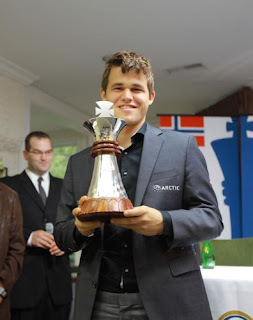 SAINT LOUIS, Sept. 16, 2013: The Chess Club and Scholastic Center of Saint Louis (CCSCSL) crowned Grandmaster Magnus Carlsen, 22, of Norway, the champion of the inaugural Sinquefield Cup, the strongest chess tournament in U.S. history. Carlsen is the No. 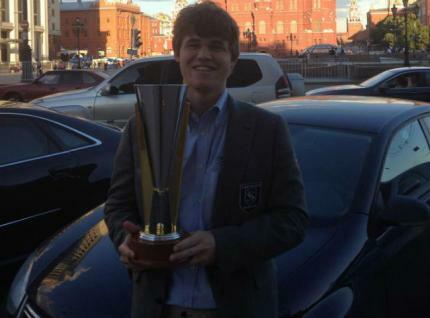 1 chess player in the world and the first-place finish in the tournament netted him $70,000. This prestigious event was Carlsen's first-ever appearance at a tournament in the U.S., and his last before he challenges Viswanathan Anand of India in November for the World Championship title. He finished a full point ahead of Hikaru Nakamura, 25, of Saint Louis, who is ranked No. 1 in the U.S. and No. 5 in the world. "The final margin of victory was a little flattering," Carlsen said at a press conference following the event. "I think I will enjoy some rest over the next couple of weeks. Then I'll have a pretty long training session, and go to India." 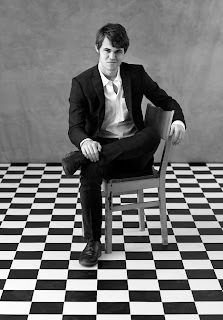 Carlsen holds the record as the highest-rated player in chess history. He was named one of TIMEmagazine's 100 most influential people of 2013 and has been the highest-rated player on the planet since he was 19. Carlsen beat out three of top-ranked chess players in the world including Nakamura, World No. 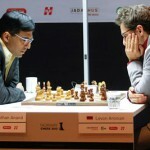 2 Levon Aronian, 30, of Armenia, and U.S. No. 2 Gata Kamsky, 39, of Brooklyn. Nakamura earned $50,000 for second place, Aronian took home $30,000 and Kamsky netted $20,000 for his last-place finish. CCSCSL Executive Director Tony Rich said this event marks an important milestone for U.S. chess. "Bringing the world's best to Saint Louis is yet another sign that the U.S. is becoming a major player in the world chess scene," Rich said. "It also further establishes Saint Louis as the epicenter of chess in the United States." Grandmaster and former national champion B. Adhiban bowed out of the chess World Cup after losing his second game on the trot against higher-ranked Hikaru Nakamura of United States in the third round in Tromso. (Left Photo B Adhiban) Overall, Peter Svidler, Evgeny Tomashevsky, Maxime Vachier-Lagrave, Boris Gelfand and Gata Kamsky guaranteed their places in the fourth stage. 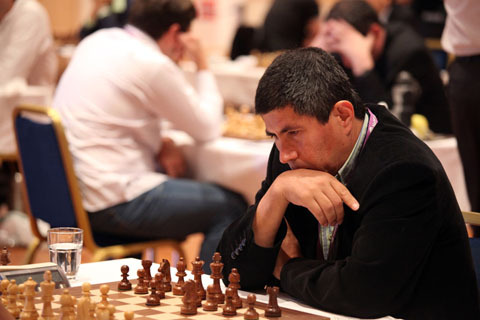 Julio Granda Zuniga levelled the score by defeating Anish Giri to play the tiebreaks on August 19. 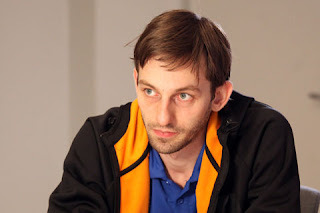 Alexander Grischuk played the longest game of the round against Le Quang Liem and managed to level the score after 154 moves and 6.5 hours. Ten matches will be decided by tiebreaks. 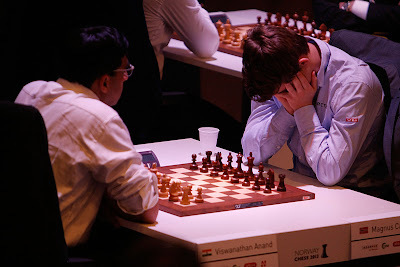 As regards the Indian challenge, losing the first game as white, Adhiban started the day in a must-win situation but his aspirations suffered setbacks as Nakamura scored another chance-less victory against the Indian. 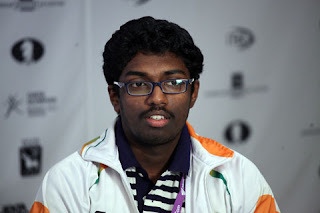 Adhiban was the best-performing Indian in the event as compatriots G. Akash and Parimarjan Negi had crashed out in the first round itself against Fabiano Caruana of Italy and Yuri Kryvoruchko of Ukraine. Incidentally, Anish had won the first game so this one too goes to the tie-break stage. Adhiban went for the King’s Indian defence against Nakamura but the American just went for an equal variation that involved trading of queens early in the opening. 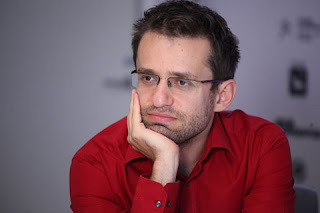 Results round 3 game 1: Levon Aronian (Arm) lost to Evgeny Tomashevsky (Rus) 0.5-1.5; Vladimir Malakhov (Rus) drew with Fabiano Caruana (Ita) 1-1, goes to tiebreak; Vloadimir Kramnik (Rus) drew with Alexander Areshchenko (Ukr) 1-1, goes to tiebreak; Le Quang Liem (Vie) v/s Alexander Grischuk (Rus) 1-1, goes to tiebreak; Sergey Karjakin (Ukr) drew with Pavel Eljanov (Ukr) 1-1, goes to tiebreak; B Adhiban (Ind) lost to Hikaru Nakamura (Usa) 0-2; Boris Gelfand (Isr) beat Alexander Moiseenko (Ukr) 1.5-0.5; Jon Ludvig Hammer (Nor) lost to Gata Kamsky (Usa) 0.5-1.5; S Mamedyarov (Aze) drew with Wei Yi (Chn) 1-1; M Vachier-Lagrave (Fra) beat Leinier Dominguez Perez (Cub) 1.5-0.5; Daniil Dubov (Rus) drew with Anton Korobov (Ukr) 1-1, goes to tiebreak; Dmitry Andreikin (Rus) drew with Aleksey Dreev (Rus) 1-1, goes to tiebreak; Peter Svidler (Rus) beat Teimour Radjabov (Aze) 1.5-0.5; Vassily Ivanchuk (Ukr) drew with Yuri Kryvoruchko (Ukr) 1-1, goes to tiebreak; Julio Granda Zuniga (Per) v/s Anish Giri (Ned) 1-1, goes to tiebreak; Nikita Vitiugov (Rus) drew with Alexander Morozevich (Rus) 1-1, goes to tiebreak. The Geneva Chess Masters Festival 2013 is taking place from June 26-30 at the Pitoeff Theatre, a renovated cathedral in the centre of Geneva. The main event will be the highlight of the big chess festival that includes two open chess tournaments and several age-group event for players U-10, U-12 and U-14. The main event - a rapid masters - will have (two groups of four each in the single-round robin format) former world champion Vladimir Kramnik, former US champion Hikaru Nakamura, top-rated woman player Judit Polgar, former world champion Alexandra Kosteniuk, Shakhriyar Mamedyarov, Etienne Bacrot, Yannick Pelletier and Romain Edouard. Each group will have the top two players advance to the semi-finals. Every match between 2 players consists of 2 games of 25 minutes + 10 seconds; if it’s necessary a tie-break of two games of 4 minutes + 2 seconds will be played; in case of a tie, a decisive game with 4 minutes + 2 seconds for white and 3 minutes + 2 seconds for black (with draw odds) will be necessary. 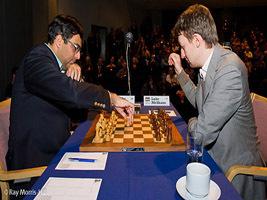 Watch the games live at the official website of the Geneva Chess Festival 2013. 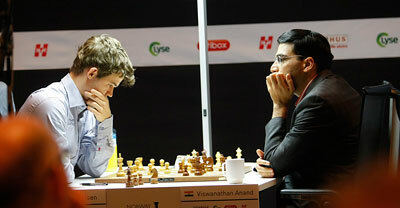 SANDNES: World champion Viswanathan Anand won the psychological battle holding his world championship challenger Magnus Carlsen of Norway to an easy draw in the second round of the Norway Chess 2013 Super tournament in progress here. The much awaited clash turned out to be a full entertainer to the audience as Carlsen tried but could not make much use of his white pieces in a keenly contested game arising out of a Sicilian defence. Both Carlsen and Anand inched to one point out of a possible two in the 10-player round-robin tournament following a draw in the opener too. 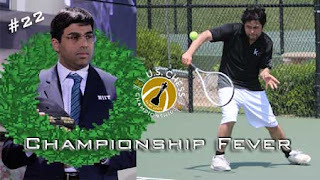 The other game to end early was a damp squib between former world champion Veselin Topalov of Bulgaria and Teimour Radjabov of Azerbaijan while Levon Aronian came up with a fine effort to outclass Hikaru Nakamura of United States. In the other two games Sergey Karjakin crashed through the defences of Jon Ludvig Hammer of Norway and, in a surprise, Peter Svidler of Russia was outdone by Wang Hao of China. After the end of the second round, Karjakin emerged as sole leader with a perfect two points out of a possible two and he is now followed by Aronian a half point behind. Anand, Svidler, Nakamura, Calrsen, Topalov and Wang Hao share the fourth spot on one point each while Radjabov is ninth with ahalf point in his kitty. With seven rounds still to come, Hammer is at the bottom of the tables, yet to open his account. Anand went for the principled Sicilian defence against Carlsen. The Norwegian had beaten Anand in the Moscow variation last time out and he stuck to the same but Anand was much better prepared this time. While the position remained equal Carlsen still had that nagging advantage he wanted to encash and Anand had to be precise in the defence even though it was not too difficult. A rook and knight endgame was reached early and thereafter all Anand had to do was to get rid of the pawns off the board. The game was drawn with Carlsen having an extra knight but no pawns on the board on move 59. Aronian crushed Nakamura out of an exchange Slav that speaks volumes about the world No 3. The position was about level out of the opening but the Armenian obviously had more ideas. Nakamura thought he was fine when giving white a queen side pawn majority but he was proven wrong in the endgame as Aronian made most of it. In the end, the American fought vainly after losing a rook for lmost nothing. As it happened, nothing came of it and he had to resign after 70 moves. Wang Hao played the game of the day outwitting Svidler in his pet Grunfeld. The Chinese was in command early in the opening and did not falter even while reaching an advantageous end-game. Results: Magnus Carlsen (Nor, 1) drew with V Anand (Ind, 1); Veselin Topalov (Bul, 1) drew with Teimour Radjabov (Aze, 0.5); Levon Aronian (Arm, 1.5) beat Hikaru Nakamura (Usa, 1); Jon Ludvig Hammer (Nor, 0) lost to Sergey Karjakin (Rus, 1); Wang Hao (Chn, 1) beat Peter Svidler (Rus, 1). SANDNES: World champion Viswanthan Anand could do little with white pieces as his opponent Levon Aronian of Armenia held him to an easy draw in the first round of Norway Chess 2013 super tournament that got underway in Sandnes. 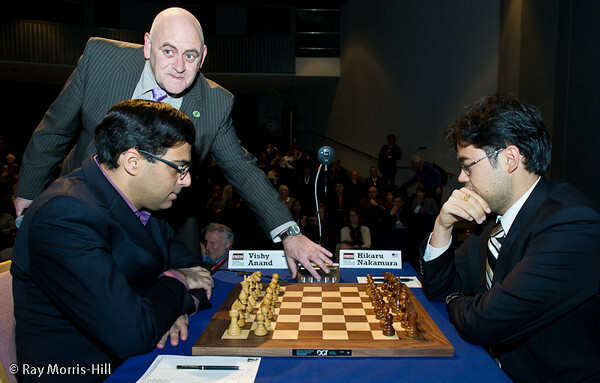 It turned out to be rather sedate Anand who has got a tough draw in the tournament. White pieces against most of the top seeds and black against lower ranked players means that the Indian ace has to be in top form to deliver the goods and in the opener Aronian was not troubled much. Sergey Karjakin of Russia continued from where he had left -- winning the blitz drawing of lots -- and put it across Teimour Radjabov of Azerbaijan whose woes continued after falling hugely in the world ranking. Norwegian world number one Magnus Carlsen, who is set to play Anand in the next round as well as in the next world championship match in Chennai, could not do more than splitting the point with former world champion Veselin Topalov of Bulgaria. The other two games in the high category 10-player round-robin tournament, however, were decisive as Russian Peter Svidler scored a lucky win over Jon Ludvig Hammer of Norway and Hikaru Nakamura proved smarter than Wang Hao of China. After the end of the first round, Nakamura, Karjakin and Svidler emerged as early leaders with a full point and Anand, Aronian, Topalov and Carlsen are close behind with a half point each. The three losers are on the bottom of the table. Anand went for the closed Ruy Lopez as white and his strategy did not yield desirable result. Aronian was well armed in the opening and as many as three minor pieces changed hands by 13th move itself. The resulting middle game with more heavy pieces was not dry but the presence of opposite coloured Bishops did not give any chance to either player. After a bit of a shadow-boxing, the peace was signed on move 33. Radjabov slipped further after a dismal show in the last candidates tournament as he fell prey to a finely crafted manoeuvre by Karjakin in the middle game arising out of an off-beat Sicilian. Playing white, the Russian sensed his chances perfectly in the middle game and his 26th move was a clincher leading to a winning endgame. Svidler was only trying to equalize a pawn less endgame against Hammer out of a Grunfeld defence when the Norwegian number two started to make a lot of mistakes. Launching his double rook on the seventh rank, the Russian won a handful of pawns to turn the tables. In the other decisive game of the day, Nakamura won two pieces for a rook with a sortie against Wang Hao to get a winning endgame. The Chinese had gone for the solid Petroff defence which did not come good as black. Results Round 1: Viswanathan Anand (Ind) drew with Levon Aronian (Arm); Magnus Carlsen(Nor) drew with Veselin Topalov (Bul); Sergey Karjakin (Rus) beat Teimour Radjabov (Aze); Hikaru Nakamura (Usa) beat Wang Hao (Chn); Peter Svidler (Rus) beat Jon Ludvig Hammer (Nor). SANDES: World champion Viswanathan Anand will take on Levon Aronian of Armenia in the first round of the Norway Chess 2013 super tournament that gets underway in Sandes. Anand secured five whites in the nine-round tournament by finishing joint second in the blitz event that was played to prepare the drawing of lots. The top five contestants in the blitz tournament will get five white and four black games in the 10-player event which is also one of the strongest ever. The much-awaited clash between Anand and Norway's world number one Magnus Carlsen will happen as early as in the second round and the latter will get to play white in that encounter. Carlsen, who had expressed his disappointment at Chennai being the awarded the hosting rights of the next world championship match between him and Anand, said he will not let that news "diminish the joy and excitement derived from playing the top level Norway chess tournament". For Anand, apart from the clash with Carlsen, it will also be a real test against a very high quality opposition. The event also boast of participation of world number four and former world champion Veselin Topalov of Bulgaria who is fresh from a fantastic victory in the Grand Prix tournament. Sergey Karjakin and Peter Svidler of Russia and Hikaru Nakamura of United States are the other players, who are a big force to reckon with while Teimour Radjabov of Azerbaijan will look forward to regain his touch. Wang Hao of China and local talent Jon Ludvig Hammer complete the line-up of the 10-player tournament to be played on a round-robin basis. For the Indian ace it has been a decent start to the competition. The blitz tournament was taken quite seriously by Anand, whose joint second finish was a good result even though he suffered a shocking loss at the hands of lowest-ranked Hammer. Sergey Karjakin won the tournament scoring 6.5 points while Anand, Carlsen and Nakamura were tied for the second spot a half point behind. Pairings round 1: V Anand (IND) vs Levon Aronian (ARM); Magnus Carlsen (NOR) vs Veselin Topalov (BUL); Hikaru Nakamura (USA) vs Wang Hao (CHN); Peter Svidler (RUS) vs Jon Ludvig Hammer (NOR); Sergey Karjakin (RUS) vs Teimour Radjabov (AZE). Former world chess champion Vladimir Kramnik caught up with leader Alexander Morozevich at the 7th Mikhail Tal Chess memorial in the sixth round with a second victory back-to-back. Hikaru Nakamura beat Alexander Morozevich as the latter got into time trouble. 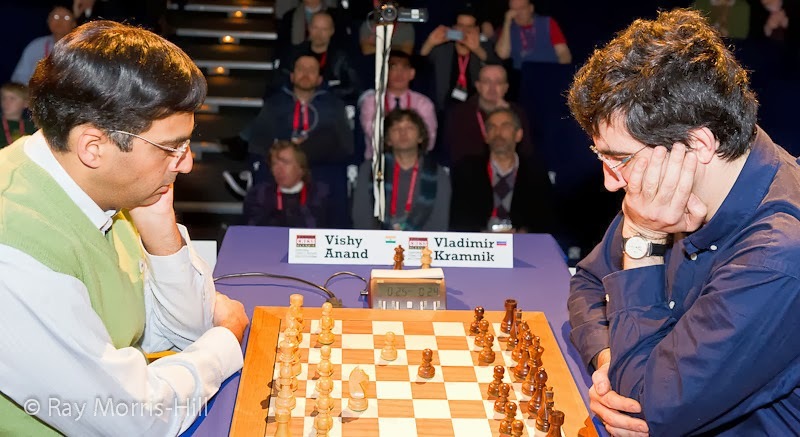 Kramnik beat Evgeny Tomashevsky. Meanwhile, Fabiano Caruana also beat Luke McShane. The other two games were drawn: Carlsen - Aronian and Grischuk - Radjabov. Tal Chess Memorial Round 2 - Radjabov Leads; Caruana, Nakamura play 107-move Draw in Seven Hours! The Tal Chess Memorial second round saw fighting games all around even though there were three draws and only two decisive games. Teimour Radjabov pulled off his second victory in as many rounds by beating Luke McShane with the Black pieces. Former World Chess Champion Vladimir Kramnik also beat Alexander Grischuk. World Chess No. 1 Magnus Carlsen survived against Alexander Morozevich and managed to draw. Two other games that ended in tough draws included Evgeny Tomashevsky-Levon Aronian and Fabiano Caruana-Hikaru Nakamura. In fact, Caruana and Nakamura played for a full seven hours flat for a 107 moves squeezing out the last bit of chess to a fulfilling draw. 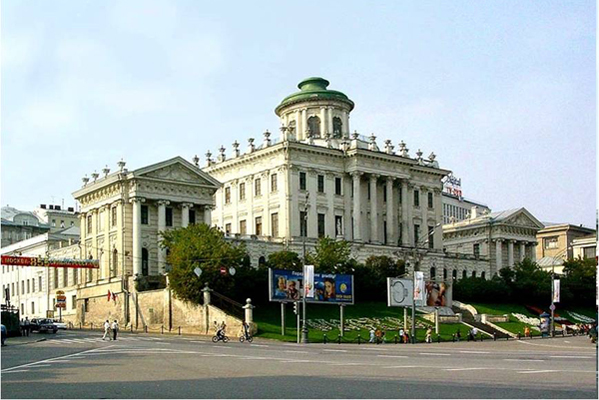 The 7th Tal Chess Memorial began at Pashkov House in Moscow with four of the five chess games ending in decisive results! 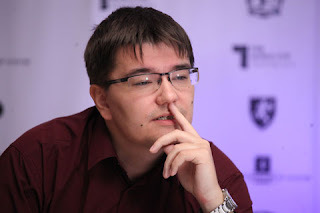 Alexander Morozevich beat Fabiano Caruana, Alexander Grischuk beat Luke McShane, Teimour Radjabov beat Evgeny Tomashevsky, and Levon Aronian beat Hikaru Nakamura! The only game that was drawn was played out between Magnus Carlsen and Vladimir Kramnik. The Tal Chess Memorial is being held from June 7 to 18. Game days are 8-10, 12-14 and June 16-18 with breaks being on June 11 and 15. The live video broadcasts starts every day at India time 4.30 pm. The time control is as follows: 100 minutes for the first 40 moves of the game and 50 minutes for 20 moves with 15 minutes before the end of the game with an increment of 30 seconds for every move beginning from the first move. On the eve of the 7th Tal Chess Memorial to be played in Moscow from June 7, we have two delightful tweets going around. These are by @MagnusCarlsen - Back in Moscow for the Tal Memorial. Excited to be fighting against the best in the world after a long break! and @GMHikaru - Farewell New York! Privet, Moscow! The line-up at the event is a dream and could very well pass off as a mini-world chess championship round-robin tournament. You can read our previous post (Tal Chess Memorial With Carlsen, Aronian, Nakamura, Kramnik Begins in Moscow June 7) about tournament details. For this report we have Magnus Carlsen's last round victory over Hikaru Nakamura in the 6th Mikhail Tal Chess Memorial in 2011. You can check out the game in our Chess King applet. Carlsen's win with Black over Nakamura had helped him tie for first with Levon Aronian who was already on fire by having played some amazing games at the event. Eventually, Magnus Carlsen won on tiebreak - thanks to this win over Nakamura. 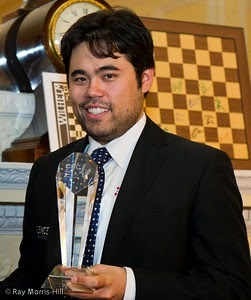 GM Nakamura has just won the US Chess Championship 2012 and would be looking to get even.